Our speaker was Dr Melissa Gillone from the University of Birmingham and she had come to talk to us about "The Evolution of Galaxies". Dr Gillone is particularly interested in galaxies and how they evolve as her PhD thesis was all about the subject. She began her talk by saying that the Oxford Dictionary definition of a galaxy is: "A system of millions or billions of stars, together with gas and dust, held together by gravitational attraction." She said that galaxies are usually found in groups of between 3 and 30 galaxies. These groups are then arranged in larger collections known as galaxy clusters and these can have from 30 to 300 galaxies within them. The clusters then form larger collections called superclusters. Dr Gillone told us that in the early Universe galaxies had a distinct blue colour, which pointed to the high rate of star formation that was occurring at that time. Also, that early galaxies were smaller, brighter and more numerous than today. Gradually, under the influence of gravity, these small galaxies merged, and so galaxies slowly grew in size until they reached the number and size that we see today. She explained that there are three main types of galaxies: elliptical, spiral and irregular. The elliptical and spiral types can be classified further depending on their shape and features. Elliptical galaxies look like disks of light that are brightest in the centre and gradually dim towards their edges. Spiral galaxies have a central bulge, disc and halo. They are divided into different types depending on how tight the spiral arms are wound and whether the central bulge has a bar across it. Our own galaxy, the Milky Way, is part of a group of galaxies known as "The Local Group", which consists of our own galaxy, the Andromeda Galaxy, and a smaller galaxy called the Triangulum Galaxy plus many smaller "dwarf galaxies". The Local Group, in turn, sits within an arrangement of groups of galaxies named the Virgo Supercluster. This hierarchical structure, defined by astronomers, is somewhat complicated by the fact that all these galaxies are moving; albeit on cosmic timescales. In fact, in another 4 billion years it is predicted that the Andromeda and Milky Way galaxies will collide. 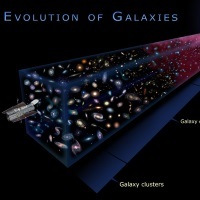 Using computer models scientists think that most of the stars in both galaxies will not be affected as the distance from any one star to the next is so vast. However, as the galaxies come together and merge they will both lose their spiral arms and transform into a smoother rounded shape known as an elliptical galaxy. In general, a galaxy can evolve in various ways that primarily depend on whether it interacts with another galaxy. If a galaxy is left undisturbed its young blue stars will gradually age and turn redder and so the parent galaxy will have an overall red colour. On the other hand, if a galaxy merges with another then the new influx of gas and dust will result in new stars forming and the amalgamation will take on a distinct blue hue. Dr Gillone ended her talk by saying she is looking forward to the launch of NASA's James Webb Space Telescope in 2019, which as part of its mission will study the earliest galaxies.